Today in Masonic History Clarence Andrew Cannon is born in 1879. 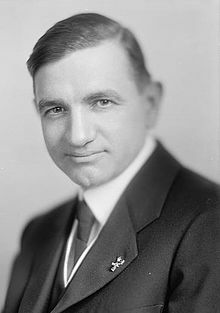 Clarence Andrew Cannon was an American politician. Cannon was born on April 11th, 1879 in Elsberry, Missouri. In 1901 he graduated from La Grange Junior College before going on to William Jewell College, graduating in 1903. He began working as a high school teacher and then as a principal, before taking a position as an instructor of history at Stephens College. Cannon found that he disliked the sedentary nature of academic life. While he was at Stephens he attended the University of Missouri where he graduated with a Bachelor of Laws in 1908. That same year he was admitted to the bar. He opened a practice in Troy, Missouri and shortly after moved his practice to Elsberry. Cannon was drawn to politics, although his first two attempts at holding public office were unsuccessful. In 1911 the Congressman for his district, Champ Clark, offered Cannon a job as his confidential secretary, he gladly accepted the position. Later that same year Clark was elected as Speaker of the House and Cannon found himself in the center of political power. From 1914 to 1917, Cannon was the House journal clerk, from 1917 to 1920 he was the House parliamentarian. It was in the latter position that Cannon became well known in the halls of power. He would go on to write two books Procedure in the House of Representatives (1920) and Cannon's Precedents of the House of Representatives (1936). The latter was reprinted in the House until 1963 with updated information. In 1922, Cannon was elected to fill Clark's congressional seat. Cannon would remain in the House of Representatives for the rest of his life. He is most notably recognized, legislatively, for being a champion of farmers in general and as a fiscal conservative, which at times put him at odds with his fellow Democrats. Cannon brought his belief in agrarian lifestyle and small-town values with him when he went to Congress. It was said that "No farm legislation was approved by Congress during the Cannon years, that did not bear the impress of Cannon's knowledge of parliamentary procedure and his influence in Congress." On the fiscal side, Cannon in 1962 denounced the so-called "$100 Billion Congress", he also referred to the space program as a "moondoggle." Cannon was known personally as someone who was easily angered and some of that spilled out into Congress. He once said of one of his fellow House members, "Of all the 'piddlin' politicians that ever piddled 'piddlin' politics on this floor, my esteemed friend, the gentleman from Wisconsin, is the greatest piddler that ever piddled." In 1945, an argument on the House floor, became violent when Cannon punched another member. In 1964, Cannon worked to establish the John F. Kennedy Center for the Performing Arts. After the successful vote, Jacqueline Kennedy wrote to Cannon thanking him for his work stating "I know the fight was not easy." In response Cannon said "You say the fight was not easy, but on the contrary, we had cooperation from everyone. It was done practically by acclamation." Cannon passed away in office on May 12th, 1964. At the time of his passing he had already announced that he would be running for another term. He served in Congress for 41 years. Cannon was a member of Troy Lodge No. 34 in Troy, Missouri.